Wash the mugs in hot soapy water, rinse well and let them dry. You can also put them through the dishwasher. Don't touch the sides of the mugs. You don't want to chance getting any oils from your skin on the mugs, because the paint won't adhere properly to the mug. 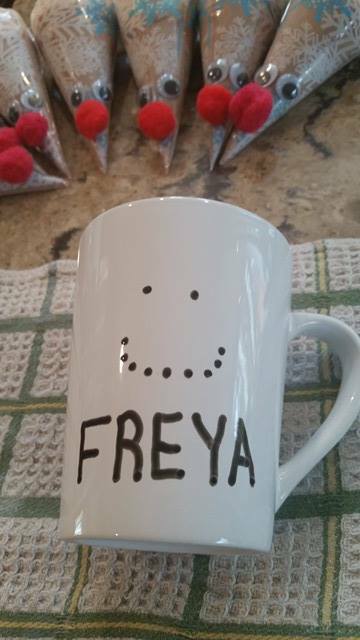 Using the black paint pen, write the name of the person the mug is for along the bottom on one side of the mug. 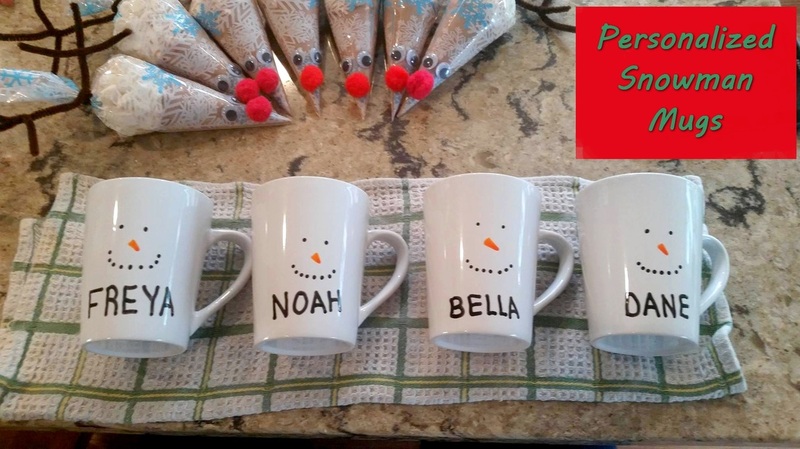 Make sure you test which side of the mug you want the picture to be on. Then draw the snowman's face by "painting" black dots for the mouth and two black dots for the eyes. We laid the mugs on a clean towel and left them that way until the paint had dried. Using the orange pen, draw a small triangle for the nose. Put 4 heaping tablespoons of hot chocolate powder into the pointy part of the cellophane bag. Make sure it gets right into the point. Add marshmallows. ( See photo for a "how much" reference). Twist the top tightly, squeezing slightly to get all the air out and wrap one pipe cleaner, tightly around the twisted part. Cut the second pipecleaner in half and attatch it to the other pipecleaner so you have three ends on each side. Trim the pipecleaner ends so they resemble antlers. Using the hot glue gun, glue a red pompom on the pointy part for a nose and glue the wiggley eyes above the nose. 4 heaping tablespoons should give the lucky recipient 2 mugs of hot chocolate. 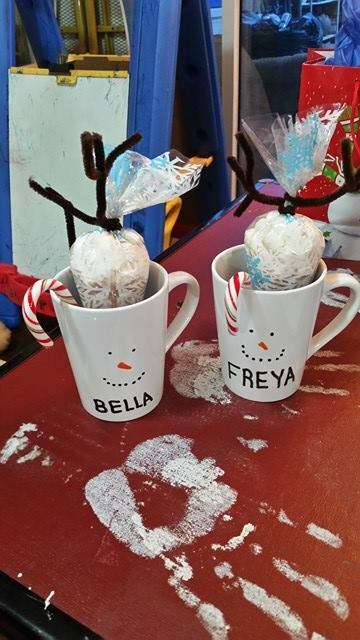 Janet added the candy canes to use as stir sticks.